Just a minute … I have our Instagram market segmentation data, tell the Board the carrier pigeon will fly the results in. Radical change. 10 to 15 years of market disruption demands new marketing strategy and new organization designs to succeed. The change required to succeed is bigger than the marketing role, the marketing function, or the marketing profession. No longer an inside out activity, marketing relevance requires reengineering from the outside in and align people, process, and technology from the inside out. This is not simply new thinking and new design, but requires radical change, enter: Reengineering the Corporation, A Manifesto for Business Revolution. Our world is a digital world. The way we access news and entertainment, connect to each other, and contribute opinion continues to disrupt strategy from product development through customer engagement. 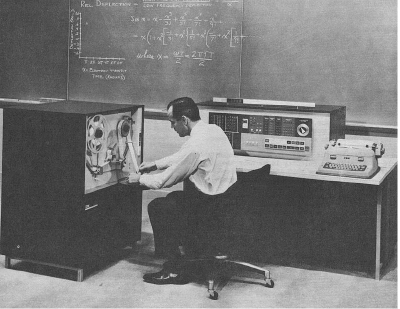 In the old, model media companies controlled access space, or real estate as access, to customers. Marketing sought to rent real estate to gain access and vie for attention. Change happened from the outside in and organizations don’t change from the inside out, unless people change. We, each of us, to include those marketing and sales professionals among us, changed when we adopted direct connection to information and to each other. Technology enabled a disruption greater than any department or team level at a company can solve. New conditions demand new business management strategy that includes a total review of people, process, and technology. 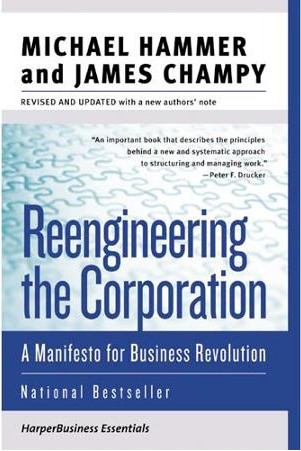 Why a 1993 business management strategy book, by Michael Hammer and James Champy, on reengineering? There is a technology link to this disruptive change, but the reengineering essence to enable change is the customer. People, process, and technology change relies behavior change. The focus starts with people. The first step … determine the customer’s requirements. [c]oncentrate on the end-to-end business processes that create all real customer value and transcend these boundaries … reengineering is breaking down the walls that separate corporations from each other. Processes do not stop at corporate doorsteps. Product development, planning and forecasting, and a host of other processes are really interenterprise in nature; they entail work by both customer and supplier … allowing information to be shared across corporate boundaries. Tradition counts for nothing. Reengineering is a new beginning. 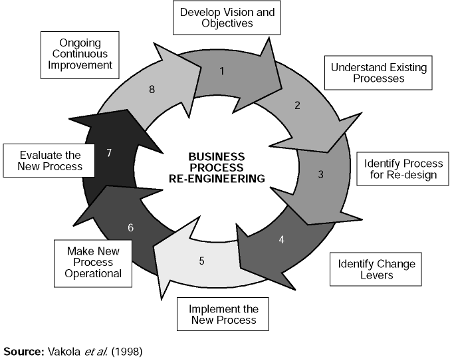 Reengineering, as we have seen, seeks breakthroughs, not by enhancing existing processes, but by discarding them and replacing them with entirely new ones. 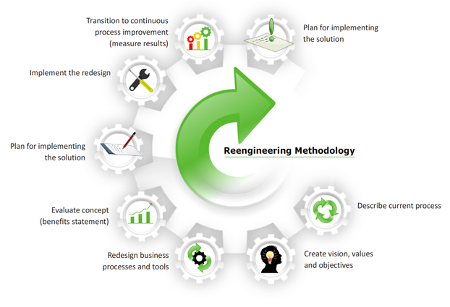 Reengineering is about inventing new approaches to process structure that bear little or no resemblance to those of previous eras. To meet new metrics, new models, and new capabilities marketing reengineering requires a new approach to both external, customer relationships and internal, company relationships. We all took part to architect this change and now the entire effort needs to align the organization in an explicit process that brings together formerly disjointed, disconnected, or missing activities that the business must do better. Revolutions are not about incremental change, but radical change, that some do not survive.